If you've clicked on here for my Christmas message - look below. This is an added bonus. Or just keep reading, cos you never know, my random wafflings might pass your clearly wastable time! 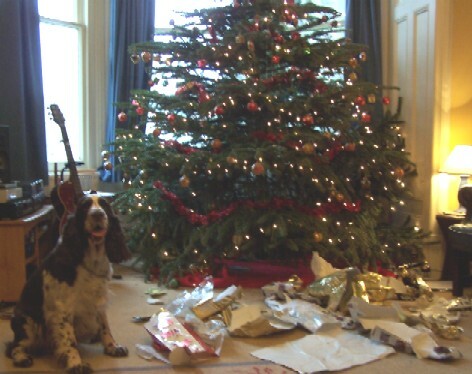 Matt (the Springer) is not much one for the presents normally. But here he is, surrounded by the detritus of Christmas afternoon, thrilled with himself for opening all his own gifts. A day or two early, true, but you must realise that in my life the next 48 hours will afford precious little time to stop and offer a seasonal thought or two to you, my more distant (in space, though not in thought) friends. The year past has been a good one, and this is an appropriate time to pause and say a quick thank you. I may have crept into decrepitude (or at least slipped past the last remnants of my youth) as I hit 40 last month, but there is a lot to be said for the well-being of these years. Not much to prove, and lots to enjoy. Even the persistent migraines of recent years seem to be subsiding a little, and the new headache tablets have helped me shed so much weight I can fit all my favourite clothes again! And I got to meet my namesake, Marcus Green, and his wife Catherine, in Cheltenham in November. A lovely evening, if a little bizarre - meeting someone who has gone through life sharing my name. Still, I think it will be a while before I meet another namesake, who happens to be a serial killer. On a personal front, I've had several trips (mostly to Switzerland - my skiing skills really are getting quite decent these days), though renewing friendships with Gideon and Michelle in Germany, and seeing Karsten there again was also wonderful. No transatlantic tours this year; my theological fame clearly has its limits - Cambridge and London, which were both fun for me, and I hope worthwhile for the people who came to hear me. I also renewed friendship with several people: Tim Savage, from Oxford - a great reunion, and great to meet his family; also my old English teacher, Robin Taylor, which has been a delight - especially receiving occasional limericks from him. He assures me they are, in fact, from his pal Andy (the poet laureate...) Ricky Carvel, JD Walt and Karen Welborn's blogs have kept me entertained and inspired. And then there was my birthday party. Thank you to all who made the journey over here. I was genuinely thrilled to see you - it means the world that we keep in touch, and to those who couldn't come, thanks for the cards and gifts. You know how much I value our friendship. It is hard to seperate the personal from St Catherine's. I have so many good friends here now, people who mean the world to me. We had a parish ski trip in February (oh yes, there are real perks to being vicar), and two 24 Hour Worship Times (see elsewhere on this blog). These were stand-out events. But so were our confirmation service, the Tuesday homegroup every week (Andy, Esther, Rhian, Guy, Rachel, Kev, Kath, Gill, David, Sam, Steph, Richard, Val, Naomi, Dan, Kirsty and others too - forgive me), every single Sunday, the growth of our children's work under Naomi Wood's care, new members joining, one or two families really growing in faith, a youth alpha group, and much more besides. The youth group went to see Delirious (a band, if you don't know) in Newport; I wasn't invited. When I first came here, I dragged a small group with me to see them. Now, it happens without me knowing, and I'm not even asked along. Fantastic! Speaking of music... The "Every Breath" CD continues to sell. iTunes is our main distributor at present. I have had the pleasure of singing with the Byron Jones Big Band this year - and will again in February 2007. My Quartet played a strange gig at the Caerphilly Flower Festival - but the best thing about that was a first opportunity to play with the amazing Osian Roberts. We have seen more of him since, and what a pleasure that has been. Stephen Roberts played a blinder at out 24 hour worship in the jazz hour, and Osian plus Gareth Roberts, Matt Price and the usual rhythm boys (Ed Wiles, Dan Jones and George Wilson) were superb at our Advent Jazz. I had a great week writing arrangements for that; one of our 80+ yr olds came up to me afterwards with a smile all over his face saying, "That's the first time I've ever swung 'Lo He Comes With Clouds Descending'!" Radio Wales have booked us to record their Easter Sunday service for 2007. Future thoughts: Come and visit! 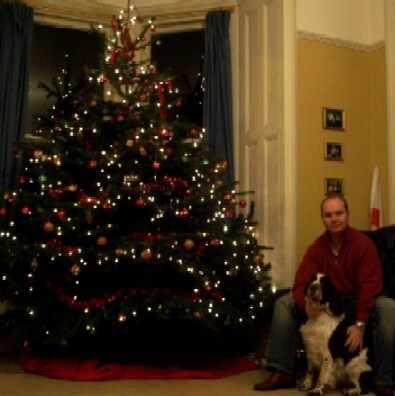 There are lots of rooms in this wonderful Victorian palace Matt the Springer and I inhabit. Enjoy Christmas. Have a good New Year - I'm off to Wengen, skiing and evangelising, suffering for the Gospel over the New Year. God is good, and I am loving life.